Despite losing his leg at the age of nine to cancer and then losing a lung at 11 due to a recurrence of the illness, Tristan Knowles’ fierce drive and fighting spirit has seen him carve out a decorated wheelchair basketball career in Australia and abroad. Tristan first found wheelchair basketball on his quest to replace his love of Aussie Rules football. Having tried every individual sport under the sun for emerging athletes with a disability, it was only when his father called the AIS to see what other opportunities there were for him that the then 15-year-old discovered wheelchair basketball. Since then, he hasn’t looked back. In 2004, Tristan was part of the team that won a Paralympic silver medal at the Athens Games, three years after making his debut for the national team. In Beijing 2008, the Rollers went one better to secure a gold medal after defeating Canada 72-60. The win was extra sweet as Australia was defeated by Canada in Athens. For Tristan, winning gold was an intense feeling of joy and satisfaction. He believes his aggression and work ethic have got him to where he is today. 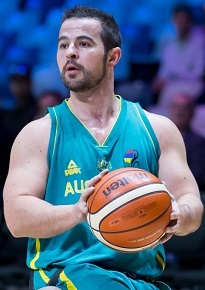 Since the Beijing Games, Tristan has continued to be an important presence in the Australian team, helping the Rollers en route to their 2010 and 2014 World Championship gold medals; victories he rates as the highlights of his career. As the defending Paralympic and World champions at the 2012 Paralympic Games, and after an unbeaten run to the final, the Rollers looked set to win gold. But it was not to be, with Australia losing to Canada 64-58 to take silver. He has continued to persevere to get back to the top of the podium, representing Australia at the 2016 Rio Paralympics and 2018 World Championships. Outside of playing with the Rollers, the Wodonga-native competes for the Kilsyth Cobras in the National Wheelchair Basketball League and has had considerable experience playing in European leagues, having played for clubs based in Spain, Italy and Turkey. Tristan also runs his own foundation, the Tristan Knowles Kids Cancer Foundation which raises money to support children with cancer, by issuing self-development scholarships. Tristan says that receiving his game chair at the age of 16 was a life-changing moment, and through his foundation, he can now provide the same opportunities to children to give them the extra boost in pursuing their dreams. Off the basketball court, Tristan loves going to the movies, travelling, spending time with his fiancé and his English bulldog Hank, and his French bulldog Carlos. His favourite movie is the Shawshank Redemption and his favourite TV shows are Suits and Boston Legal.